Chanteuse Country US née le 17 Juillet 1972 à Wildwood (Floride). Country singer/songwriter Elizabeth Cook made her Grand Ole Opry debut on March 17, 2000, appearing repeatedly thereafter — a remarkable achievement considering that, at the time, she was an indie artist with no radio airplay. But such was the excitement generated by her clear, beautiful voice, strong songwriting ability, and live performances, all of which have drawn comparisons to younger, critically respected artists like Kelly Willis and legends such as Dolly Parton. Cook was born in Wildwood, FL. Her West Virginia-born mother played guitar and mandolin and sang on local radio shows. Her father, a Georgia native, also performed country music and served jail time for running moonshine. Upon his release, he and Elizabeth's mother played in local bands together, eventually marrying. 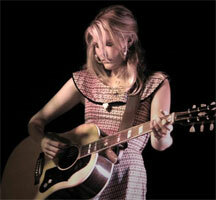 Elizabeth, born in 1972, moved to Nashville in her twenties and quickly got a publishing deal. Demos recorded between 1997 and 2000 comprised her self-titled, independently released debut album, which showcased her formidable songwriting ability and featured such well-known Music City musicians as Tim Carroll, Kenny Vaughan, and Rick Schell. Atlantic Records signed Cook soon after its release, and she began working on her major-label debut. Hey Y'All appeared in summer 2002 from Warner Bros. Constant restructuring at the label meant Hey Y'All didn't get the promotion it needed, and Cook left the imprint and released 2005's This Side of the Moon on Hog Country Records. Balls appeared in 2007 from 31 Tigers, followed by Welder in 2010, featuring guest spots from Dwight Yoakam, Rodney Crowell, and Buddy Miller, also on 31 Tigers. Over the next five years, in addition to touring and becoming a staple at the Grand Ole Opry, hosting her Sirius XM radio program Apron Strings, and touring, Cook went through a series of transformative personal changes. She lost a parent, got divorced, and saw a sibling through rehabilitation after a long bout with drug addiction. When she re-entered the studio, it was with co-producer and guitarist Dexter Green. After self-financing an album, she undertook a Pledge Music campaign to assist in getting it released. Exodus of Venus was released in June 2016 through Thirty Tigers.